This adjustable patella strap applies comfortable pressure to your patellar tendon, treating a variety of knee conditions, including runner's knee, jumper's knee, Osgood-Schlatter disease, patellofemoral pain syndrome, patellar tendonitis, and more. This patella band is available in sizes ranging from XS-2XL. To determine your size, PLEASE CAREFULLY MEASURE the circumference around your mid-kneecap. Use a soft, flexible tape measure and refer to the second image above for further measuring instructions. If in between sizes, order a smaller size. This knee strap fits kneecap circumferences ranging from 12"-20". 1. This knee band is discreet and low-profile, allowing you to comfortably wear it underneath your clothing and during physical activities. 2. This patella strap features a solid tubular neoprene pad, which applies pressure to your patella tendon, reducing pain and quickening your healing process. 3. Manufactured from premium-grade, latex-free soft loop neoprene, this knee strap can be worn comfortably all day. 4. The buckle and Velcro closure make this patella band easy to apply and adjust to a customized fit throughout your healing process. 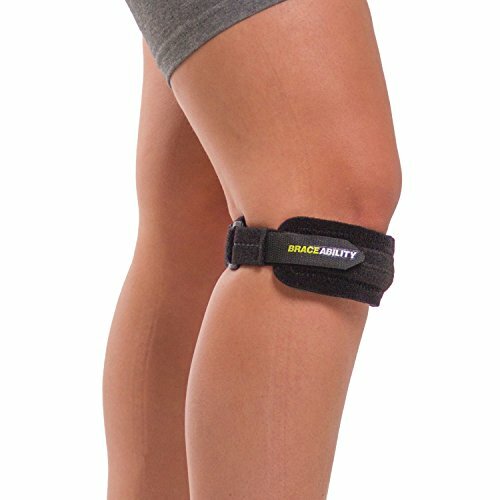 How do I use this patella strap? - Place this knee strap directly underneath your patella. - Make sure the pad is centered in the front underneath your kneecap. - Secure the velcro strap to your desired compression level, making sure that the strap is applying pressure underneath your patella. PLEASE MEASURE CAREFULLY! Before choosing a size, use a soft, flexible / fabric tape measure and refer to the second image for measuring instructions. For best results - have someone take your measurements for you. Measure the circumference around the middle of your kneecap. Size L fits 15"-16". This knee band for runner's knee, jumper's knee, patellar tendonitis, and Osgood Schlatter disease treatment helps reduce knee pain and swelling, while treating a variety of other conditions affecting your patella as well. This knee brace is constructed out of premium-grade, soft loop neoprene, providing warmth, compression, padding, and support to your sore patellar tendon. The buckle and Velcro closure make this patella strap easy to adjust to your preferred level of pressure and support.